I've always believed that the world is changing as more people choose to work for themselves. We are starting to eliminate the need for bosses or a rigid work structure. We are slowly finding creative ways to make an income doing things we actually enjoy doing. This isn’t just a trend or a passing fad. It’s a new way of life, and we’re just getting started. That's why I've teamed up with 2 incredible women, Casey Hynes, a talented writer who has launched her freelance career internationally and Charmie Stryker, a brilliant stylist in both communication and visual design. 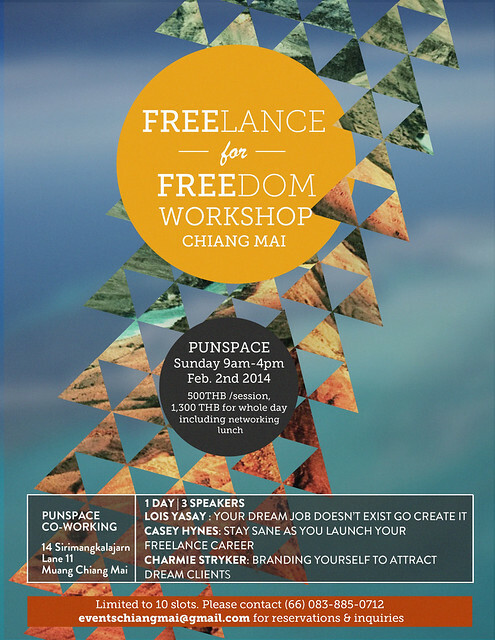 We’re inviting independent entrepreneurs, online business owners, and freelancers to join us for an empowering workshop in Chiang Mai, Thailand: Freelance for Freedom on Feb 2, 2014 at Pun Space. 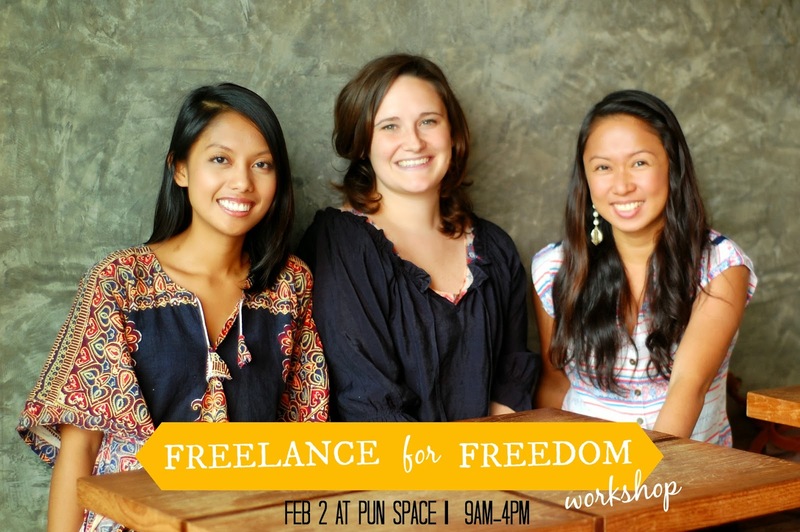 Freelance for Freedom Workshop is a one-day event that features 3 different speakers and focuses on how you can look into your passions, strengths and skills to create a path of your own design. It will empower you to find what you love, launch yourself into your dream freelance career and create your unique brand identity in order to stand out. Lois Yasay will talk about Your Dream Job Doesn't Exist, Go Create It which is a hands-on and interactive workshop that allows you to ask yourself: What do I really want to do for a living? Finding out what you want from life is the first step in realizing it. Then she will help you identify your core strengths and skills to design your ideal job. Finally, she gives you the tools to put your plan into action and launch yourself into your dream career. Lois worked for multinationals in training and development for over 5 years before she decided to follow her number one passion: travel. She went on a 6 month backpacking trip around Asia and documented her experiences on her travel blog: http://www.wearesolesisters.com/. She continues to escape the corporate world and has transitioned into becoming a writer, social media manager and motivational speaker. She is also a certified Passion test facilitator and has been organizing workshops and retreats focused on helping others do what they love and make a living from it. Casey Hynes will discuss Setting Yourself Up for Success: How to Stay Sane as You Launch Your Freelance Career. She'll talk about what you should do before you make the leap to freelancing, how to build a respectable body of work while still paying the bills and why it's essential to set your standards before taking on your first client. 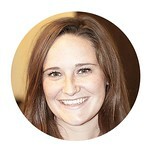 Casey is a freelance journalist and editor and has spent several years living and writing in Asia. She has lived in South Korea, China and Thailand and traveled throughout the region. She is a 2008 graduate of Columbia Journalism School in New York City and her work has appeared in The Wall Street Journal, Vogue India, The Magazine and a number of regional publications. Her writing can be found at http://www.caseyhynes.com/. Charmie Stryker will talk about Branding Yourself to Attract Dream Clients to help you discover your core message and show you how to translate your unique story into your brand. 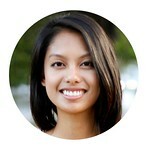 She'll offer helpful insight on how to funnel your concepts and inspirations to enhance your visual identity. She also teaches you how simplifying your niche can bring clarity to your message. Lastly, she will share simple ways to bring cohesiveness into your website, logo, business card and images to gain more credibility and attract your dream clients. 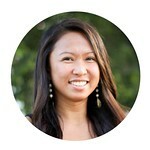 Charmie is a stylist in both communication and visual design. She spent her sunny days in Austin TX helping her clients at Austin Woman Magazine find their unique voice and enhance their visual identity to better maximize their impact. She took her love for marketing and creativity on the road when she decided to travel and freelance full-time for some amazing and oh-so savvy clients in branding, creative content and social media management. With her experience in the magazine industry, her knowledge in marketing and her passion for travel, she recently launched http://newcropshop.com/ where she combines imagery, storytelling and trinkets while being an advocate for creative independence. 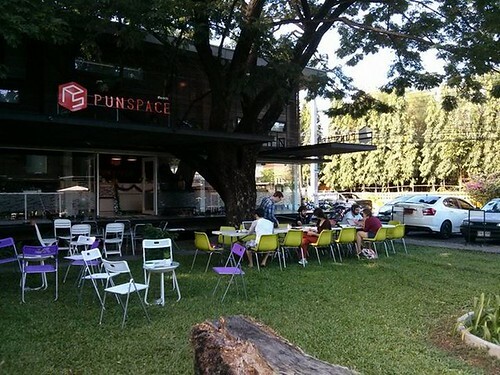 Please share this with friends who are in Chiang Mai!